ATHENS, April 21 (Xinhua) -- The first cruise ship carrying a group of Chinese tourists to the Aegean Sea islands set sail from Greece's Piraeus port Friday after a celebratory event. 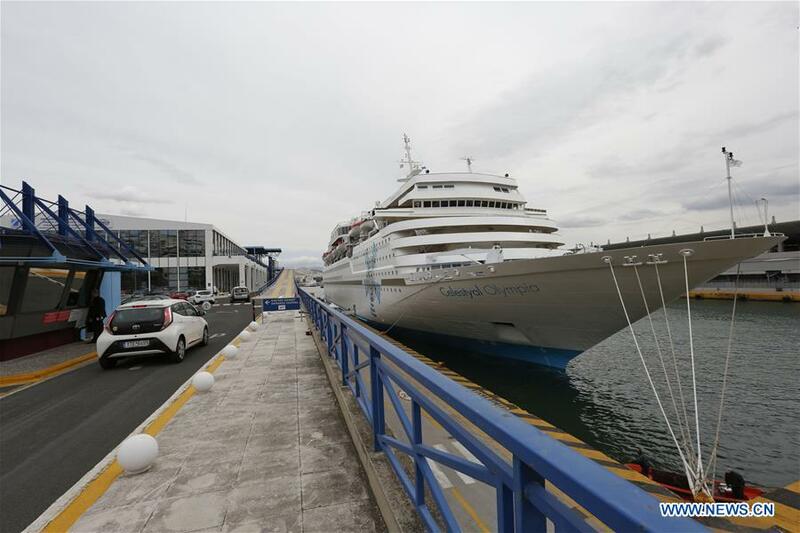 It is the first time ever a group of more than 200 Chinese passengers boarded a Celestyal Cruises ship at Piraeus, Greece's largest port, for a four-day cruise in the Aegean Sea. The ship will dock at Mykonos, Kusadasi, Samos island, Patmos, Herakleion port city on Crete island and Santorini before returning to Piraeus next week. "I am very excited to hear that we become the first group to come to this port. I think I will enjoy this trip; And of course I think when I come back I will introduce it to my friends," Chinese tourist Xiao Yu who is about to board the ship told Xinhua. Chinese shipping giant China COSCO Shipping, which took over the management of Piraeus Port Authority (PPA) last year, aims to bring more Chinese tourists to Piraeus and the Greek islands in coming years, PPA CEO Fu Chengqiu said while addressing the celebratory event. "We want to become a bridge linking Chinese tourists to Greece, and welcome more and more Chinese visitors who will enjoy cruise vacations here in Greece with quality service," Fu said. Fu said they would like to work together with the Greek government and partners to embrace more tourists from China and other countries worldwide in a bid to triple the overall one million tourists Piraeus port currently handles per year to 3 million in the long term. As cruise vacations have become extremely popular in China in recent years. In order to facilitate the journey from China to Greece, a deal with China Eastern Airlines is due to be finalized shortly to start bringing Chinese tourists to Greece on chartered flights, Fu revealed. The ambitious goal to attract more Chinese travelers to Piraeus is shared by the Greek side as well as major cruise industry players like Celestyal Cruises. Celestyal uses Piraeus for home porting in cruise itineraries, and in the past five years more than 650,000 passengers have boarded its cruise ships at the Greek port. This year, the company expects at least 2,000 Chinese tourists on its Aegean Sea cruises. "Our company's target is to carry on our ships at least 50,000 Chinese travelers by 2021," Celestyal Cruises President Kyriakos Anastassiadis told Xinhua. "The Chinese market is the largest market for the cruise industry worldwide. It is rapidly developing and we believe that Greece has to offer a remarkable tourist product to Chinese nationals, and also an ideal service which meets their demands," added Anastassiadis.